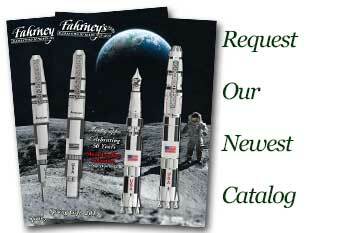 Order your Fahrney's Exclusive Esterbrook J Series Fountain Pen today from FahrneysPens.com. Fine Pens, Refills & Luxurious Gifts – great prices & fast shipping. Esterbrook, America's original pen company since 1858, is proud to introduce the new "J" series collection of fine writing instruments. Originally, produced by Esterbrook in the 1950's, the "J" model became one the brands most popular pens. The new "J" series has been updated with modern design enhancements for today's pen aficionado. Each pen is made from a unique marbled acrylic reminiscent of the 1950's retro era. A Silver plated clip and band with the iconic Esterbrook logo complete each pen. Available in three stunning finishes, Safari Green, Red/Navy Marble and Black Pearl in both Fountain Pen and Rollerball. The Fountain Pen features a German iridium medium steel nib. Cartridge/converter fill. Converter included. An okay at 5 dollars. Terrible at MSRP. Not worth the money. There are many other fountain pens at this price point that are far better. Just received the pen yesterday. Been doodling for about an hour now and the pen writes very smooth and nicely. Very handsome pen. Not happy. It's no way like the original. Box is cheap with a sticker on it. Pen is a copy from another manufacture. Very awkward to hold.